What a wet winter! It has been very soggy of late, which is perhaps why the village geese were still hanging around at the farm for most of the month. We hope we’ve now seen the back of them as they were starting to eat the spinach! 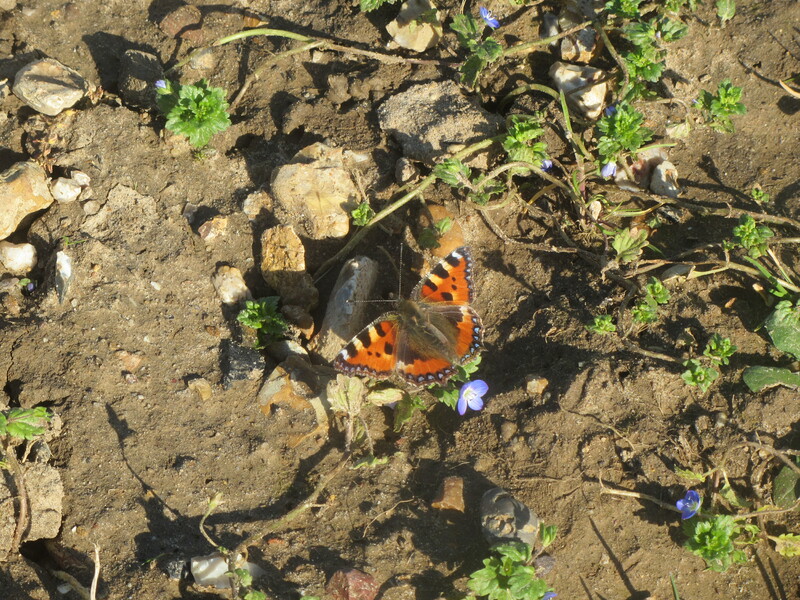 On one particularly sunny day towards the end of the month I saw at least 3 small tortoiseshell butterflies out and about. This species is one of only 5 UK butterflies that overwinter in their adult form, rather than as eggs, caterpillars or pupae. 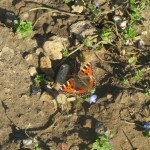 On sunny winter days it’s always worth keeping an eye out for them. Large flocks of fieldfares made a dramatic sight on occasions this month, but they were nothing compared with the huge flocks of woodpigeons flapping in and out of the small woodland from time to time. The kestrel has frequently been mobbed by rooks on its regular visits, which always seems rather unfair, but he keeps coming back so he obviously isn’t too bothered by them. The occasional dramatic sparrowhawk flight along the hedgerow is worth looking out for. There have been a few spotted in recent weeks. These impressive hunters swoop low, fast and with amazing agility around obstacles, using surprise as their main weapon in their hunt for small birds.